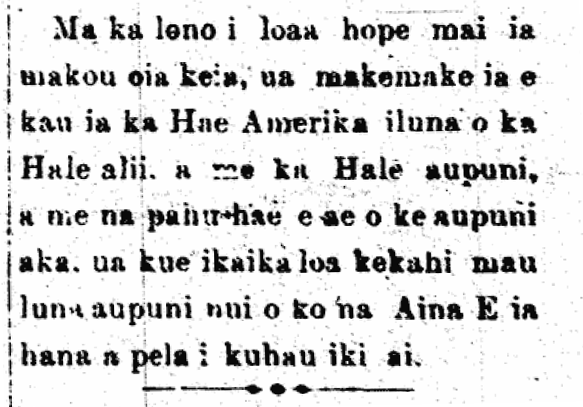 Another article on the lowering of the Hawaiian flag from Iolani Palace, 1893. The royal standard was lowered from the flag pole of the Palace this past Wednesday, and it is not known when it will be raised again, and the former Queen, Liliuokalani, returned to her home in Waikiki to live. Ka Nupepa Kuokoa, Buke XXXII, Helu 3, Aoao 2. Ianuari 21, 1893. More on the flag, 1893. According to the last news we received, there is a desire to raise the American flag above the Palace, and the government buildings, and up the other flag poles of the nation, however, there are some high-ranking officials from other nations who are protesting it vehemently; and that is how they barely remain. Ka Leo o ka Lahui, Buke II, Helu 625, Aoao 2. Ianuari 19, 1893. Two marriages, Chung Hoon/Akina & Koki/Kuaea, 1896. This past Thursday night, as we mentioned earlier, mauka of the residence of Rev. H. H. Parker, William H. Chung Hoon (Uilama Kanahana) and Miss Alo Akina of Kohala, Hawaii, were bound together by him (Parker). The husbandʻs neighborhood held a reception at Kauluwela, which was followed by a feast. On that same night, after that marriage above, in the church of Kaumakapili, joined together by the Rev. H. H. Paker, was Solomona Davida Koki to Miss Esetera U. K. Kuaea. The couple arrived at 8, and it was performed immediately. There was much waiting until the church was filled with the crowd. The young girl is the organist of the church, and a student of W. Tela [W. Taylor? W. Tell?]. W. Tela played the organ while the marriage ceremony took place. There was a reception held after at the girlsʻ school of Kawaiahao, and a feast the day following at Waikahalulu. The couple boarded the Kinau of this Saturday morning to spend their first days of marriage in the land of the husband, at Waimea, Hawaii. Ka Makaainana, Buke VI----Ano Hou, Helu 24, Aoao 1. Dekemaba 14, 1896. 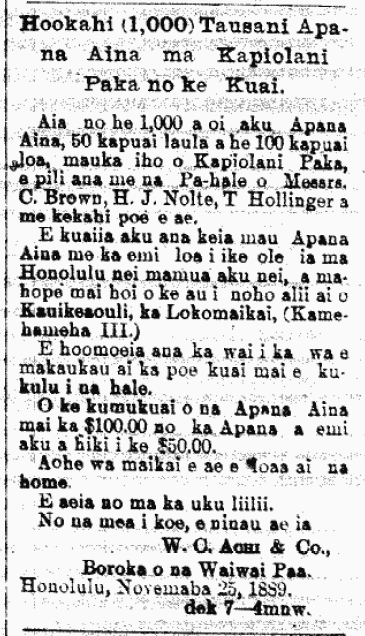 Land next to Kapiolani Park on sale, 1896. One Thousand (1,000) Land Parcel at Kapiolani Park for Sale. There are 1,000 plus Parcels of Land, 50 feet wide and 100 feet long, upland of Kapiolani Park, adjacent to the house lots of Messrs. C. Brown, H. J. Nolte, T. Hollinger and some others. These Parcels will be sold at low prices that have never been seen here in Honolulu before, from the time of the rule of Kauikeaouli, the Kind-hearted (Kamehameha III). The water will be laid when the buyers are ready to build their houses. The price of the Lots run from $100.00 per Lot, all the way down to $50.00. There is no better time to get a home. W. C. Achi & Co.
Ka Makaainana, Buke VI----Ano Hou, Helu 24, Aoao 2. Dekemaba 14, 1896.